Prohibition kills: education saves lives. Learn and never skip the safety measures. 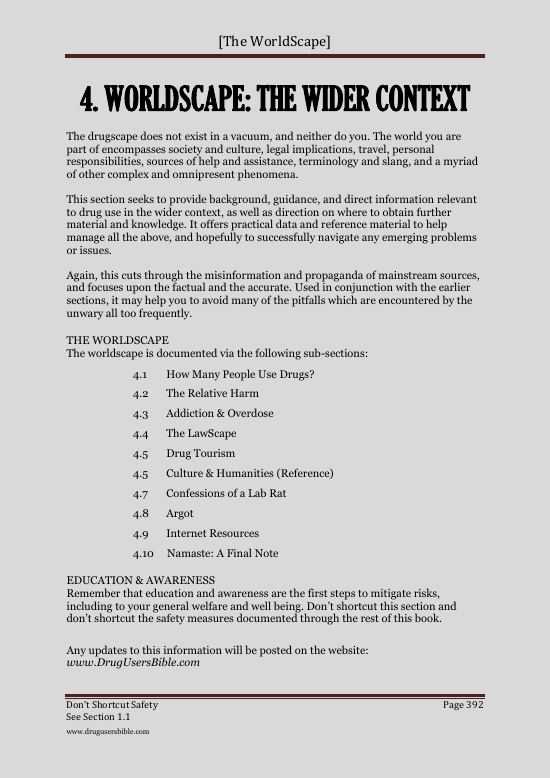 Please browse this website for more information on The Drug Users Bible. Prohibition kills: education saves lives. Drug use does not exist in a vacuum. This section covers the wider context. The book spans some 514 pages. The full table of contents can be viewed on this web page. You can download the 10 point safety form from here: PDF. This was produced to be used in conjunction with the safety procedure presented in the book itself. See also The 10 Commandments of Safer Drug Use. This is an alphabetical list of botanicals and chemicals self-administered during the writing of this book. Don't blame us for anything that we are not responsible for. Leave us alone. See the preface for the book here. The Table of Contents is provided here. For further details please follow the links at the top of this page.